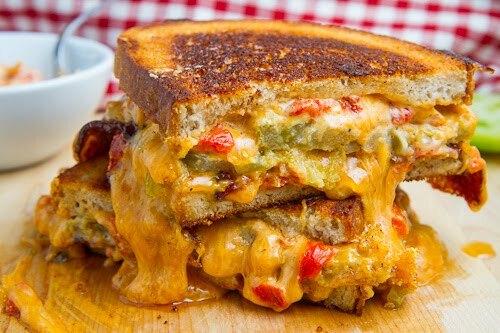 Crispy fried tart green tomatoes with bacon in a grilled cheese sandwich with plenty of melted sweet and spicy pimento cheese! Another fall treat is green tomatoes which make a brief appearance at the farmers market when the weather threatens to destroy the tomatoes before they ripen. Ever since I first discovered them I eagerly await them each fall and this weekend they made their first appearance. Inevitably the first thing that I do with them is to make some fried green tomatoes which is a Southern dish where slices of green, unripe, tomatoes are coated in cornmeal and fried until crispy. After an initial batch of fried green tomatoes I wanted to combine them with another Southern delicacy, pimento cheese , a combination of cheddar cheese, pimentos and mayonnaise, and make, you guessed it, a fried green tomato and pimento cheese sandwich! Pimento cheese was practically made for use in grilled cheese sandwiches especially when all melted and good and combined with crunchy and tangy green tomatoes and salty bacon! Pimento cheese, where have you been my whole life? Butter the outside side of each slice of bread, place one slice in a pan buttered side down, spread on half of the cheese, then top with the the fried green tomato slices and bacon followed by the remaining cheese and slice of bread, buttered side up. 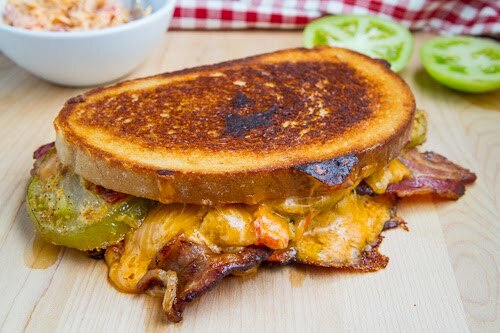 A Southern classic with cheddar cheese, mayonnaise, sweet pimiento peppers and a touch of heat. That sandwich looks fabulous. I want to eat my computer screen. I am not kidding. It's delicious!!!! Again, another mouth-watering recipe! Looks so yummy. This looks amazing, but you so do not have to wait for fall!!! My favorite part of the summer is picking green tomatoes for fried green tomatoes. My family is lucky if any of our tomatoes ever ripen!!! Thanks for sharing, I'll be fixing this tomorrow for lunch and I'm pinning your recipe right away! Pimiento Cheese – with cream cheese ????? Other than that, it sounded pretty good. Sinful! This sandwich is just awesome. Amazing!!!! The first photograph, its telling how yummy this would be. Too tempting. BTW do join my weekend dinner extravaganza. lets make the party a big success. I never realized that green tomatoes were a fall thing! This grilled cheese sounds absolutely addictive. All that gooey cheese is making me seriously hungry. This looks awesome. This is soo my kind of sandwich, but I have an issue with fried green tomatoes. I have to eat them plain on a plate until I can't eat anymore and I do it all during the month of Sept.
Maybe if I can get my fill this year (since the garden is still chugging along), I'll give this a try, because it does look like the best…sandwich…ever…. James: Steak and egg sandwiches are definitely good! Your sandwiches are the best. Hands down. This is so creative.